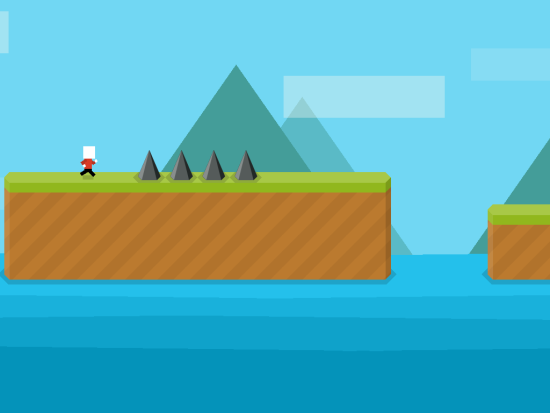 Mr Jump is a free iPad tapping game to jump and avoid obstacles. Sounds easy, right?? But let me warn you, this iPad tapping game isn’t as easy as you are thinking. 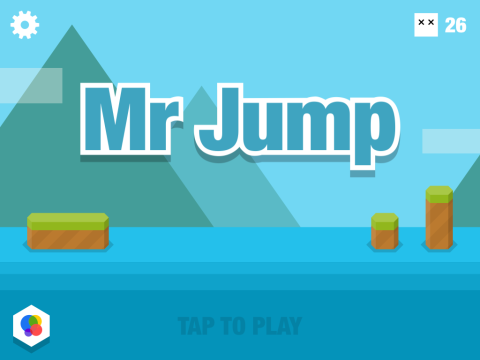 Mr Jump is a really interesting, fun, entertaining game which also tests your reaction time and reflex actions at the same time. 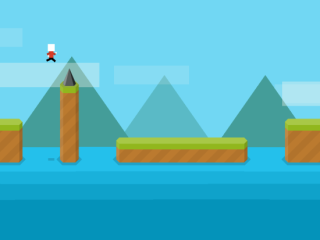 The concept of Mr Jump is quite simple: you have to make a character jump, avoid obstacles, and make him reach the finishing line. But what makes this game really interesting are the challenging levels. There are a total of 12 simple but challenging levels for you to play. Mr Jump lets you connect your Game Center account for submitting your score and to check your ranking among global players. There is also an offline leader board where you can see your own stats across all the levels. On launching Mr Jump game on your iPad, you will see the interface as shown below. When you tap on the screen, you will see the list of all the 12 available levels. The first level in the game is unlocked by default, while the rest of them are locked. You can unlock higher ones only by completing the lower levels. At the start of the level, you will see the character as shown in the screenshot below. This character automatically moves from left to right and you only have to take care of its jumping. You have to make sure the character avoids obstacles. To do this, you have to make him jump at the correct moment and for correct time period. To make the character jump, you need to tap only once while to make him jump longer and higher, you have to tap and hold on the screen. But you need to be really focused on the game for making him jump at the right moment and for appropriate time. The things which make the game interesting and challenging are: Increasing speed of character and random & sudden appearance of obstacles. If you fail to jump at the correct time, then your character will hit the obstacle and game will be over. At the end of the game, you will see the interface as shown below. 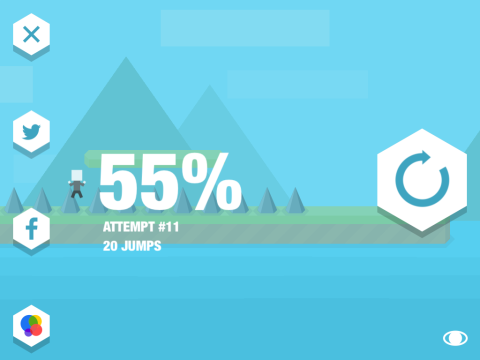 From here; you can check the percentage of level completed, number of attempts, and number of jumps. You can also choose to see the Game Center global leader board as well as the offline game stats. You may also like: iPad Arcade Game To Test Concentration, Speed, Dexterity. Mr Jump is a good iPad tapping game which not only tests your reaction time but also the concentration. The random type of obstacles make the game even more interesting. Do give it a try to experience the fun yourself.